The Ski Train is photographed climbing the grade just west of Rocky siding and starting the ascent into the 'Little Ten' and 'Big Ten' curves on its journey west with Skiers bound for Winter Park Resort. A Blizzard had pounded Colorado's Front Range two days prior and the hike out to the curves proved very difficult, especially when navigating the two to three ft wind driven snow drifts. The Flatiron formations of Boulder can also be viewed coated in snow behind the Ski Train. Sadly, this was the Ski Train's next to last run over the Front Range. 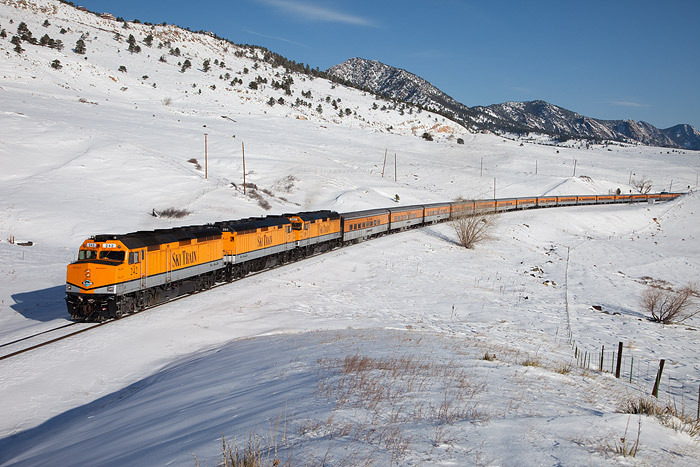 After 69 years of service, The Ski Train was sold and this Colorado tradition was halted. The Ski Train had a great run and it will be sad to see this beautiful train and icon leave Colorado. Photo © copyright by Thomas Mangan.